Recently, Trey Turner, a local NYC musician, made news when he dropped an engagement ring off of the Brooklyn Bridge, in the midst of a proposal. Reportedly, his hands were shaking from nerves and the diamond engagement ring slipped through his finger, lost to a grate below. All was not lost however, when a week later a Department of Transportation employee found the ring and delivered it to Turner’s fiancé. But according to the New York Post, Turner was not the first man to fumble a ring off of the Iconic New York City bridge; in 2009 Don Walling dropped his intended’s ring into oncoming traffic below. Not waiting for the D.O.T’s help, Walling climbed down into oncoming traffic to retrieve the ring. There are, unfortunately plenty of stories like these; tragic but understandable when nerve’s gets the better of a groom. And while the lucky recipient of the ring may not have to worry about dropping the ring as much, there are other irritants that can keep a ring off of that third finger. Less tragic than slipping, there is spinning. ‘Spinning’ refers to when a ring is so top heavy it turns itself upside down during a normal day’s routine, typically a complaint of women who type on a computer for hours on end. The unique design of the Paradiso collection keeps the engagement ring upright and in its proper place without sacrificing blood flow in your finger. The Paradiso Collection of engagement rings is Verragio’s solution to this potential problem, without compromising style for comfort. 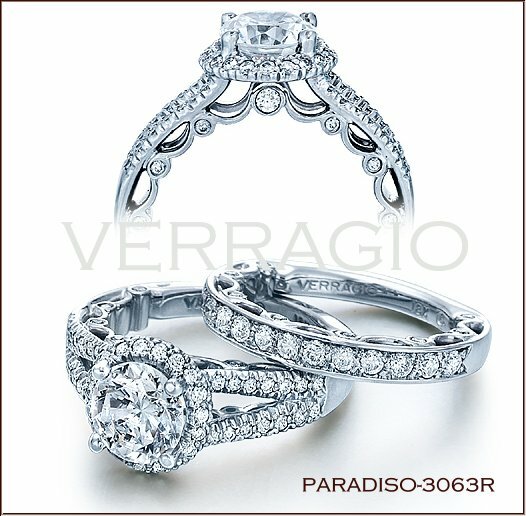 Just like any other Verragio collection, there are a multitude of styles within the Paradiso line to choose from, such as split shanks, three stone designs, and the exclusive Lumino setting. But within the Paradiso collection, each ring has a unique scrolling design inside the band that hugs your finger and prevents it from slipping. So if you love the heavily stylized designs from Verragio but worry that it may be a little too much for your finger to handle, consider an engagement ring from the Paradiso collection. Besides, the only time your ring should be slipping around is on the New York City subway, and on purpose. This entry was posted in barry verragio, verragio. Bookmark the permalink.